What was the Allogeneic Stem Cell Transplant like? It was the 23rd of January when the countdown to receiving my donor's stem cells began. It was actually more like a countup (if there is such a word), due to the way in which, with stem cell transplants, the days are numbered around the day when the stem cell infusion takes place; Prior to infusing the stem cells the days are given a negative number (the 23rd of January was day -8 for me), after infusing the stem cells the days are given a positive number (today is day +59 for me), and not surprisingly the day of the stem cell infusion itself is day zero (the 31st of January for me). My day -8 was very much like a typical check-up really, as a nurse took some blood samples for testing purposes, and a doctor reviewed the results of those tests and listened to my breathing etc. The only thing that wasn't so typical was that I needed to sign a consent form; In this case, to state that I understood the potential benefits and risks of having an Allogeneic Stem Cell Transplant (Allo-SCT) and that I wished to proceed. Once that was all over and done with, I actually went home, as everything looked good and the actual treatment wasn't due to start until the next day. It was day -7 when I was admitted to the hospital ward and the actual treatment began in the form of what is known as the conditioning regimen, i.e. the part of the Allo-SCT procedure with the main purpose of preventing the infusion of the donor's stem cells from being attacked by the patient's immune system, thus enabling them to safely make their way into the patient's bone marrow, where they will ultimately take over the production of various blood components and consequently provide a cure for the patient's disease. In my case, the disease being Hodgkin's Lymphoma, the blood component being the white cells that form the immune system, and the cure coming from an immune system better equipped to recognise and eliminate cancerous cells. There are a number of different conditioning regimens, but for my case the regimen chosen was FMC; It consists of Fludarabine, Melphalan and Campath (also known as Alemtuzumab). The FMC regimen belongs to the category of conditioning known as reduced-intensity conditioning (RIC), i.e. the category where the regimens are more easily tolerated, hence can be given to patients that would likely find regimens in the standard (full-intensity) conditioning category too harsh for their bodies to handle; Typically, the heavily pre-treated (such as myself) or the elderly find the most benefit from RIC. Although FMC falls into the RIC category it can still have some pretty unpleasant side effects, some of which I recently encountered myself. So, how did things go for me, I hear you say? Well, on day -7 through to day -3 (inclusive), I was administered (intravenously) a dose of the chemotherapy called Fludarabine, and with the exception of softer stools it didn't seem to bother me at all. On day -7, I was also started on a number of supportive treatments, which are aimed at preventing potential side effects of the chemotherapy, but are obviously not without risk of their own side effects, hence one or more of those may have also contributed to the softer stools. 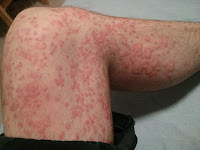 The supportive treatments were: Ciprofloxacin and Metronidazole (anti-biotics), Itraconazole (anti-fungal), Aciclovir (anti-viral), Fragmin (anti-coagulant), Ondansetron and Domperidone (anti-sickness), and Allopurinol (kidney protection). On day -2, I had my first dose of Campath, which proved to be quite eventful. 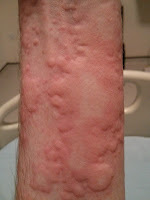 I had been forewarned by a number of medical professionals that you are pretty much guaranteed to have a reaction to the first dose of this antibody treatment, even though you are given Piriton (antihistamine), Hydrocortisone (steroid) and Paracetamol (analgesic and antipyretic) to minimise the potential for and severity of such a reaction. The reaction that I was forewarned about was that it was highly likely that I would develop a high temperature and shiver/shake a lot; On the surface, that didn't sound too bad, but from how it was being described it was clear that I was under-estimating how unpleasant it can be. However, as it turned-out, my reaction was most unusual. 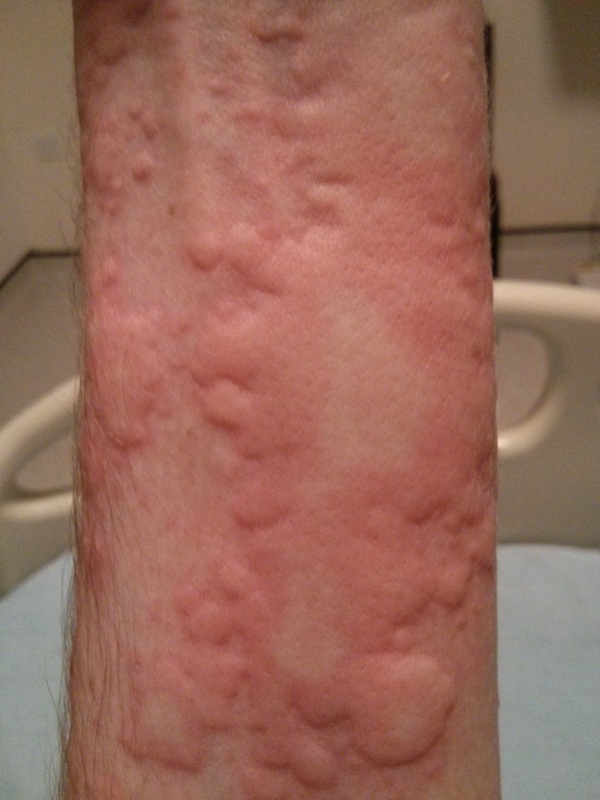 I wasn't worried about the rash, as the nurse said that in a few hours I'll just be red, and the redness will gradually disappear over the next couple of days, so other than it being slightly itchy it was nothing really. 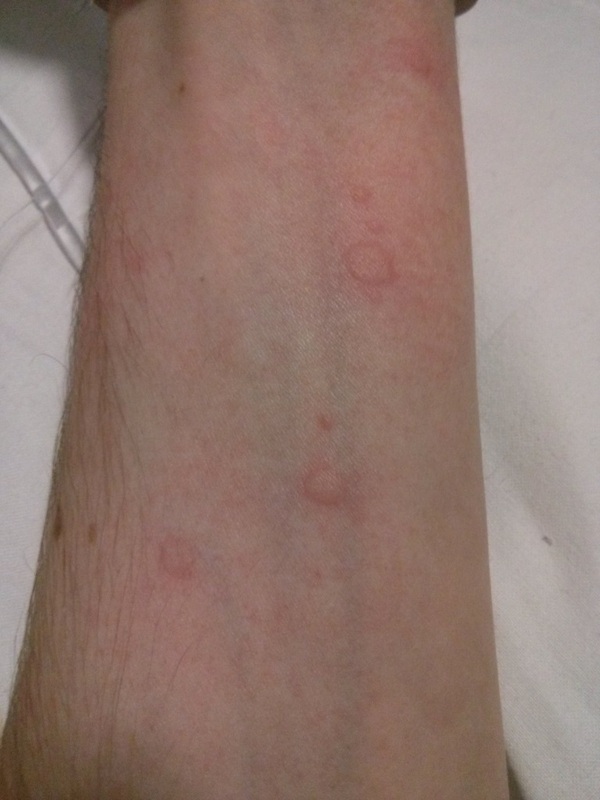 To be honest, of the two of us, I think the nurse was worrying more, as whilst the nurse tried to find a vein in my arm (from which some of the blood samples could be taken) I noticed the nurse's hands felt quite hot, even though I was the one with a high temperature. To be fair, the nurse was doing all of the work though; All I had to do was sit and watch! Once the nurse had taken all of the necessary steps, news of my reaction started to spread, and not surprisingly that meant a few nurses and doctors came to see me, mostly just to take a look! The rash actually disappeared much quicker than expected, as when I got up in the middle of the night to go to toilet (about ten hours later) there was no sign of it whatsoever. However, I was due two doses of Campath, so there was a possibility of another reaction with the next/final dose. Having said that, the reaction is normally very mild after the first dose, and may even not happen at all, as the first dose tends to do the vast majority of the work. My next/final dose went ahead on day -1 (the next day) as planned, and as expected my reaction was very mild; This time the rash was confined to my face, and was nowhere near as impressive as with the first dose. On day -1, I also started the twice-daily infusions of ciclosporin to suppress my immune system, and was administered (intravenously) the dose of the chemotherapy called Melphalan. The ciclosporin didn't bother me, except for when its level in my blood stream was too high, as that resulted in a headache that didn't disappear until the dose was reduced to compensate. However, Melphalan is a whole different story, as it commonly results in Mucositis, which is not very nice at all, as I know all too well. Mucositis is a painful inflammation and ulceration of the linings of the digestive tract. It takes a few days before that particular side effect appears, hence I'll say more about my experience with it later in this post. At this point, I just needed to drink plenty, as it's important to quickly flush the Melphalan out of the body. In fact, the hospital pharmacy won't even make-up the Melphalan, due to its short shelf-life, until you've passed half a litre of urine that day. To much frustration of the nurse looking after me, my bladder was feeling a little shy that day, so it took a while, but once it rained it poured! On day zero, twenty-four hours after the dose of Melphalan, it was finally time for the infusion of the donor's stem cells. It had been a little over seven months and a whole bunch of treatments since finding out that my cancer had relapsed, all of which were leading towards this one moment, so you might expect that with all of the build-up the opening of the package containing the donor's stem cells would at the very least be worthy of a drum roll, but disappointingly it was nowhere near as dramatic as you might hope, as inside the extensive packaging was merely a small bag of fluid that looked very much like those seen all of the time with blood transfusions. It was simply hooked-up to my hickman line and dripped in over about thirty-five minutes, and that was that. For the next one or two times that I went to the toilet, my urine was perhaps slightly red (not quite normal), but otherwise it was as if it never happened. At this point, the treatment was essentially over, as all that was left was waiting for the donor's stem cells to make their way into my bone marrow, where they could ultimately take over the production of various blood components and hopefully lead to a cure for my cancer. Of course, it wasn't quite as simple as that, as before I could start to get better, I first needed to get through the period where the side effects of the recent treatment were at their worst. In other words, as my various blood counts dropped, because of the recent treatment, I would start to feel the side effects. Some of the supportive treatments that I mentioned earlier on helped with coping with the side effects, e.g. the anti-sickness medication, but as I also hinted at earlier on, when I mentioned Mucositis, what was ahead was still no walk in the park. Consequently, it is likely no surprise that the supportive treatments were amended over this period. I'm not sure when exactly some of the supportive treatments stopped, as it was quite hard to keep track, due to what felt like regular buckets of numerous different tablets being dropped off by the nurses each day; I really just worked my way through each bucket taking a few tablets at a time (not always knowing what they were). Having said that: Allopurinol is normally only prescribed for something like a week, when having the first dose of a treatment, as after that the kidneys no longer need the additional protection that it provides, due to any subsequent doses of that treatment causing the kidneys relatively little extra work, so it may have stopped at about day zero; Fragmin is only needed when the platelet count is fifty or more, as below that point the risk of developing blood-clots is minimal, hence my last injection of it was probably on day +3; and finally Ciprofloxacin and Metronidazole were only needed whilst the neutrophil count was below one, as above that point the immune system alone should be capable of providing protection from the associated infections of most concern, which meant that they were both likely only needed for me up to day +16 (inclusive). It was slightly easier to keep track of when new supportive treatments were required, and as such I know that: on day +6 through to day +17 (inclusive) I was given Filgrastim injections, in order to encourage my bone marrow to produce neutrophils, thereby speeding-up the recovery of part of my immune system; on day +8 and day +12 my platelet count was sufficiently low that I needed a transfusion to increase it, thus minimising the risk of uncontrolled bleeding; on day +16 my hemoglobin count had dropped to the point where I needed a red blood cell transfusion, as that would improve the delivery of oxygen to tissues around my body, as well as the disposing of carbon dioxide from them, and therefore lead to me having more energy; and finally, also on day +16, my neutrophil count reached at least one, so it was time to start Co-trimoxazole, with the aim of preventing an infection that often proves hard to treat. If you've made it this far, you are now likely thinking, so what about the Mucositis? Well, it was about day +10 when that side effect started to bother me. I had been using a mouth wash called Difflam a few times a day, and that combined with regular brushing of my teeth and rinsing of my mouth with water is likely what meant that my mouth and throat were not too badly affected by the Mucositis (there was only a few ulcers). However, my esophagus didn't escape so lightly, and that meant swallowing anything was painful, which led to me being sick on a few occasions, e.g. when I tried to have something to eat or take my medications. The issue with keeping medications down is what led to my medications switching from oral to IV for a few days, whilst the Mucositis issue was sufficiently under control that I could then switch back again. The controlling of the Mucositis came in three parts: pain relief, anti-acids and mouth wash. More specifically: the Difflam mouth wash was replaced with the Lidocaine mouth wash, which I could swallow, thereby allowing it to reach my esophagus; I was started on Oxetacaine, i.e. 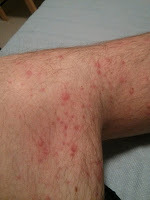 a local anaesthetic and anti-acid, which also needed to be swallowed; Another anti-acid called Pantoprazole was also made available for when the Oxetacaine wasn't enough; A morphine patch was put on my arm; and a morphine nasal-spray was also made available for when the morphine patch wasn't enough. Even though the Mucositis was pretty unpleasant, the medications were effective at masking this side effect, which meant that waiting for my body to heal itself, as my blood counts started to come back up, was much more tolerable. However, finding the right dose of morphine took a bit of experimenting, and that proved to be a not too pleasant experience in and of itself. I started with a 10mg patch and an optional 10mg nasal-spray, but that didn't seem to be enough, as I was frequently using the nasal-spray, perhaps partly because unlike the nasal-spray, which is quick acting but soon wears-off, it takes a bit of time for the patch to deliver a constant dose. My patch was then doubled to 20mg and the optional nasal-spray quadrupled to 40mg, but that increase was too much, as whilst it masked the pain it also caused hallucinations. The hallucinations can be quite scary, as they were in my case, and even though they were pretty much confined to when I closed my eyes that wasn't much comfort. It's hard enough to sleep well in a hospital as it is, what with all of the different lights and sounds, frequent toilet visits, and nurses checking your blood pressure, temperature, pulse and oxygen saturation every four hours, without also adding scary hallucinations into the mix. My hallucinations were perhaps best described as vivid nightmares, which were so clear that it often wasn't easy to differentiate them from real life. When awake, I did also sometimes notice moving shapes out of the corner of my eyes, even though nothing was there, and real sounds in my room being distorted in my mind; For example, at one point, I remember thinking the repetitive sound that the IV pump was making sounded like "rest in peace", which is not something that you want to hear at the best of times, never mind from an IV pump infusing drugs into your bloodstream. That reminds me of a funny story, albeit one that was quite scary at the time, as one night, whilst still fine-tuning the dose of morphine, I woke-up having just had the very same dream that I'd had the previous night, only much like in the movie groundhog day, the dream was only the same when I took the same actions. Also, much like in time-loop movies etc, the second time around I noticed things that I'd not noticed the first time, even though I now recognised that I'd simply over-looked them; In my dream, I even remember thinking "that was clever". Anyway, that combined with: waking-up at the same time as the previous night, the IV pump making the same creepy sounds, my mouth feeling equally odd from the Mucositis, the eerie atmosphere of the hospital in the middle of the night, and (last but by no means least) the too high of a dose of morphine in my system, all led my confused mind into concluding that I was dead! As I sat there for a minute or so, thinking that I was dead and was perhaps in some kind of after-life time-loop, I decided the best thing to do was press the button to call a nurse, and see what happens. As I waited, I remember thinking that, of all of the days to relive, did I really have to endlessly relive suffering from Mucositis, and then it occurred to me how those I left behind must be feeling right now, as I was probably the last one to realise that I was dead. Anyway, at hopefully no surprise to you, it wasn't long before the nurse that was looking after me that night came to see what I wanted; At the time though, I wasn't sure what to expect, e.g. would no-one ever come? The first thing that I said to the nurse was that I'm confused, as coming straight out with "Am I dead?" just seemed like the wrong approach to me. The nurse asked if I knew where I was, and I looked around and said "Well, it seems like my hospital room", to which the nurse responded by smiling a little, commenting that I didn't seem sure, and asking why I was uncertain. The nurse's response made me think that I was being carefully guided into accepting that I'd died, i.e. much like with addictions the first step was truly accepting it, so that was when I decided I simply needed to say that I thought I was dead, i.e. that what I was seeing was just some seemingly clever mirage. The nurse once again smiled, and proceeded to take a seat and ask me a few more questions etc, all aimed at helping me to snap out of it, but nevertheless they just seemed to convince me even further that I was indeed dead; For example, the nurse reminded me that I'd been: suffering from Mucositis, prescribed morphine for it, and thus was hearing things etc - That reminded me of the IV pump seemingly saying "rest in peace", so in my mind the nurse was telling me that I never made it through it, and I'd simply dismissed all of the signs. Anyway, after talking to the nurse for a few minutes, the nurse asked me whether I'd like to see the doctor, so I said "Yes", as I was thinking that perhaps only the doctor is the one that can drop the facade. As I waited for the doctor, it wasn't long before another nurse came in to see me, but just to do the four hourly check of my blood pressure, temperature, pulse and oxygen saturation. I made some comment to that nurse that obviously demonstrated that I was still thinking I was dead, as the nurse responded by saying "Don't worry, you're still with us". As the nurse left, I remember thinking, I don't doubt that, but the real question is who are us, and where are we! It was probably a couple of hours before a doctor actually came to see me, as I'd imagine in the scale of things going to see a patient high on morphine was of no great priority, by which time I was snapping out of it. I explained everything to the doctor, and to my recollection the doctor pretty much just listened to me and then got up and left, i.e. there wasn't much that could be said; my morphine dose just needed reviewing, so that it hopefully wouldn't happen again. It wasn't long before my morphine dose was reduced down to just a 10mg patch, and then stopped altogether, as my blood counts were coming back up, and my body was healing itself, so I likely didn't need the morphine any more, and after experiencing the side effects I was keen to get off it. I did continue with the Lidocaine and Oxetacaine for a bit longer though; I decided to drop the Lidocaine first, partly because it didn't taste so nice, but also because the Oxetacaine helped with excess stomach acid, which was still sometimes making me sick. When to stop the medications is a bit of a guessing game though, as you never really know whether you feel fine because of the medications, or because you've now recovered, so you really just have to try and see. As I was stopping the various medications aimed at helping me through the Mucositis, because I was recovering, it was time to start thinking about what was required before I could go home. There were a few requirements, as I needed: my neutrophils to stay above one (without Filgrastim injections); to make the switch from IV to oral ciclosporin (without a struggle to maintain its level in my bloodstream); and my platelets to be twenty or above (without a transfusion). The neutrophils weren't an issue as from day +16 (inclusive) they had remained above one, the switch from IV to oral ciclosporin took place on day +19 (inclusive) and went smoothly, but much to my disappointment my platelets danced around in the teens (covering every possibility) and continued to just not quite make it to the point where I could go home. In the end, after about a week of my platelets going up and down slightly, i.e. being fairly stable, the doctors decided that, on day +22, I could go home, as it was unlikely that my platelets would suddenly drop, thereby requiring a transfusion, so there was little value in me staying! Despite having soft stools, being lacking in energy, having no real appetite (I'd lost about a stone), and occasionally suffering from excess stomach acid that was making me sick, I was still keen to get out of there; I was by no means a picture of health, but after four weeks and one day in there, I was convinced that home was the best place for me. I was on my way home just as soon as I had my supply of medications from the hospital pharmacy, and my next appointment for a check-up was booked (in just three days time). In case you've lost track, the medications that I was still taking were: Ciclosporin (immune suppressant), Aciclovir (anti-viral), Itraconazole (anti-fungal), Co-trimoxazole (anti-biotic) and Domperidone (anti-sickness). The day previous, the dietitian had given me some strawberry and vanilla ready-made milkshake style drinks, known as Fortesip Compact, which are produced by Nutricia; These drinks provide the proteins, vitamins, minerals and trace elements needed in a healthy diet, and are intended for people that are struggling with eating sufficient solid food, so in the short-term these were really also considered to be part of my medications.